We have qualified mechanics working to get your equipment back up to speed. Coupled with our machine shop we can take care of any repair: major or minor. Using professional tools and equipment we get your job done right with professional style quality! 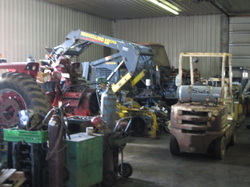 Repairs that require used parts are easily made with such a large variety of used parts instantly available.